5 pc. Carbide Forstner Bit Set, 1/2" - 1-3/8"
Roman Carbide DC1918 - 5 pc. 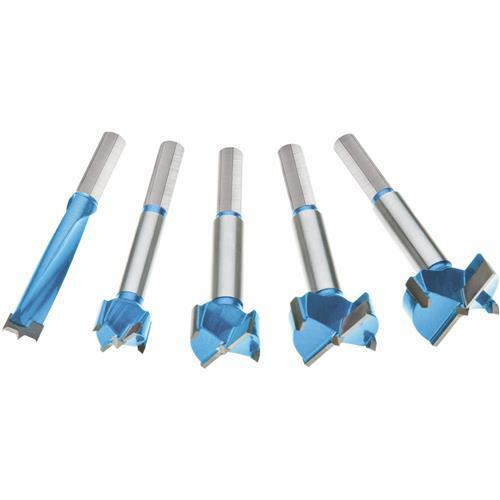 Carbide Forstner Bit Set, 1/2" - 1-3/8"
These Roman Carbide® Forstner Bits are some of the nicest Forstner bits available! Micro-grain carbide cross tips and center cutters stay sharper longer, for years of dependable service when drilling hard and soft woods, face grain, end grain, and figured grain. Carbide cross-tips and center-cutters also provide smoother, chatter-free, and faster cutting results. Hex shanks guarantee no slipping, unlike round shanks, which result in scarring and diminished accuracy. Hex shanks fit 3/8” drill chucks. Includes 1/2", 3/4", 5/8", 1", and 1-3/8" Forstner Bits.